Am I telling you to have a chocolate mylkshake for breakfast? Yes. Am I saying it will change your world and alter your taste buds' perception of reality for ever more? Yep. 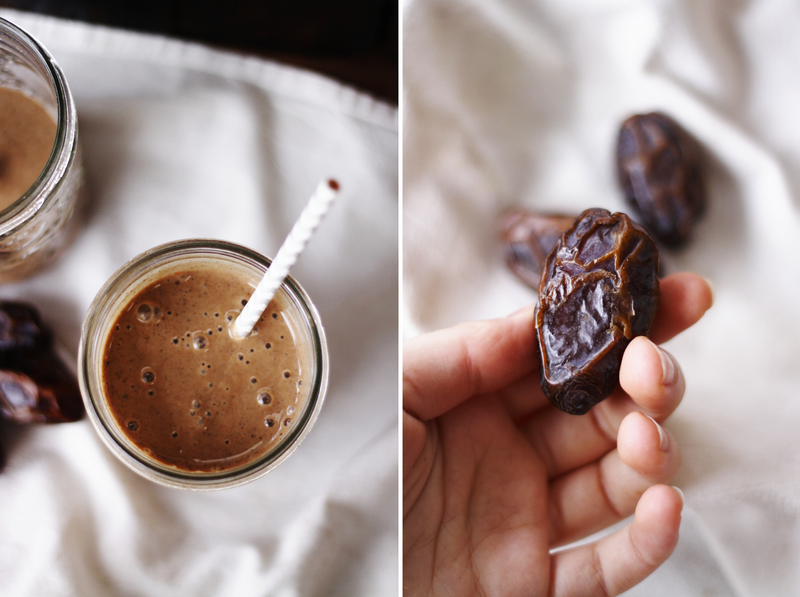 Am I claiming said creamy, dreamy, sweet choco shake is super healthy for you? Oh, baby, hell yeah. Will I stop asking questions now? Fine. Okay. I don't usually eat stuff like cacao right away in the morning, and I don't normally have coffee at all; but I woke up today and wanted to make a face mask from coffee grounds and cacao powder (mix them both with water to make a paste, rub it on your face and leave for 10 minutes to get gorgeous skin). I didn't use all the mixture so I decided to throw the extra in my Vitamix with frozen bananas, almond mylk and dates. I know, right: basically ALL the good things. As I was saying to my lover the other day, "I have no reason to be sad when I have bananas in my freezer and ripe avocados on the shelf." Can anyone disagree. I didn't put a question mark at the end of that because it's not really a question. Maybe you're one of those folks who's all like "COFFEE IS EVIL, KEEP AWAY FROM IT!" First off lemme say that I don't even really like coffee so I'm not directly disagreeing with you. But let's think about this: in almost every way, coffee and cocoa/cacao are very much the same; and almost everyone is passionately on-board the cacao train of health and positivity. It seems like the "problem with coffee" is that in today's world, people are pretty much addicted to it and more importantly, they are addicted to it in a very processed form (like instant coffee with white sugar and dairy cream). That ain't good. All I AM SAYING is that a lil bit o' fresh, organic, fair trade coffee beans can actually be a great addition to your diet every now and then. The benefits of drinking black coffee have been studied and are pretty influential. In any case, coffee is definitely awesome for body scrubs and facial masks. Psst... also... in this recipe. Yum. Let's do it up. Blend it all up until smooth and creamy, then drink it down. For the wiiin! Note: most of the ingredients are optional... just blending up frozen bananas is *freaking amazing*. The bf would LOVE this! I'm not a fan of coffee but it looks so amazing I'd give it a go! This is a great whole foods blog. I don't know how you take such beautiful photos! I love my smoothies and shakes. What is " lucuma powder "? and are ground coffee beans edible? If so, where can I get them? I am from South East USA. And yes ground coffee beans are edible :) Just buy coffee beans and grind them up! Are you serious about coffee beans? I grind my coffee beans for auto-drip coffee machine and throw the coffee sediments and you are saying I can put that same ground coffee and eat the sediments? Wow, I did not know that! Well, don't we learn something new everyday when we are open-minded? I will try skipping the lucuma powder. That looks awesome. I love coffee and chocolate. I have to find the lucuma powder and try it out. And I agree, coffee has benefits. As long as it's not loaded up with milk/cream and sugar. Fantastic photos as well! No coconut meat would be delish! never froze your bananas! it's big mistake! I love chocolates Thanks for sharing this..
You make a great point. Got some great information here. I think that if more people thought about it that way, theyd have a better time understanding the issue. Your view is definitely something Id like to see more of. Thanks for this blog. Its fantastic and so is what you've got to say. Love your site! Thanks for posting great recipes. Been sugar free for 15 days- and these raw treats are helping me realize this life long dream come true- not just a short term diet. Vitacost.com has the lucuma powder! Awesome tips. I've been trying to eat more raw foods myself. At first it tastes weird some of these foods. But after a while you just don't want processed foods anymore. Coffee in smoothies is genius, love it! I love homemade cold-brewed coffee, back when I was drinking it more, I would brew up a whole pitcher and drink it throughout the week. So good!